We strive to always offer you the finest brands, services and experiences. We strongly believe that the only way to succeed now and the years ahead is to be responsible in everything we do. We are strongly committed toward sustainability and we are proud of the incredible involvement of all our employees. Together, we promote a responsible drinking lifestyle, we strive to protect our environment and we work hand in hand with our local community. Our employees are our best ambassadors. We cultivate their engagement and empower them to take an active role in our responsibility approach. We promote a collaborative work environment where openness, diversity and well-being are a priority. We reach out to others, build friendships and support people around us. We work with local and national charities to encourage our employees to roll up their sleeves in support of our local community. We run a dynamic volunteering programme that brings employees together to share experiences that embody our core values of conviviality and entrepreneurial spirit. We take an active part in our Group’s engagement to protect our environment all along the supply chain. 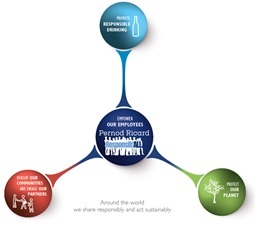 Discover everything about our global Sustainability and Responsibility approach and actions!